Friends participates in a project that is underway throughout the tidal marshes of San Francisco Bay to eradicate invasive non-native cordgrasses (Spartina spp.). Since 2003, we have received funding from the California State Coastal Conservancy’s Invasive Spartina Project (ISP) to work toward eliminating three species of introduced cordgrasses and their hybrids with the native cordgrass found in our estuary. These destructive plants alter both the structure and function of tidal creeks and wetlands, harming native bird, mammal, and fish species. Invasive cordgrasses also clog open channels, increasing flood risk and reducing navigability of waterways. 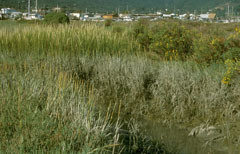 The various cordgrasses found in San Francisco Bay have different growth habits and preferred locations in the marsh. The ISP has researched eradication methods and has followed standard Integrated Pest Management protocols to develop the current treatment techniques. For the cordgrasses that spread by underground rhizomes, spraying individual plants with an herbicide containing the active ingredient imazapyr is effective. We dig out the invasive cordgrass that has a bunching growth habit, and employed the North Bay Conservation Corps for this work until 2014. Now that the infestation is grealty reduced, ISP monitors dig the few remaining plants during their surveys. The ISP has carefully documented the project, including the staff’s thorough analysis of the various treatment methods; the documentation is available on ISP’s website at www.spartina.org. 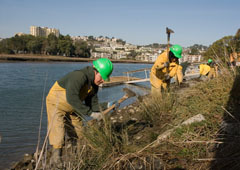 The North Bay Conservation Corps worked with Friends for nine years, digging out and hauling away non-native cordgrass. We carried out a pilot project at Piper Park in Larkspur starting in 2003. In 2005 through 2008 we treated all of the infestations in the Corte Madera Creek estuary, except for a few spots where individual property owners would not grant permission for the treatment; unfortunately, these untreated plants continued to produce seeds. After invasive cordgrasses were listed by the California Department of Agriculture as noxious weeds, the Agricultural Commissioner contacted the uncooperative property owners and all agreed to treatment. Now all the infestations of invasive cordgrasses on private property can be treated. Approximately 95% of the invasive cordgrasses have been eliminated. Follow-up treatments will be done over the next few years to complete the project. For large marshes where Ridgway’s rails breed, the treatment season is September through January. In other areas, we can dig throughout the year and spray when the plants are growing. We wish to thank all those property owners who have participated in this project, the aim of which is to maintain the richness of plant and animal life in our marshes.